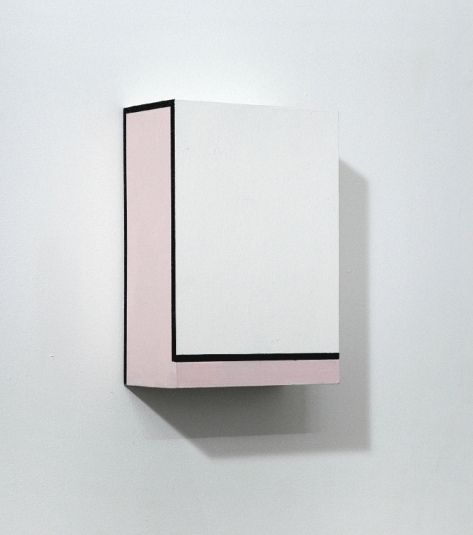 Richard Roth is in a group show with friend Richard Schur at Rocket Gallery, London. The title of the show is Merger. Rocket often merges minimal and concrete art with furniture and design. In this case Roth is both minimal artist and furniture designer. Richard is a painter out of Munich. His recent work uses a lot of bare linen with slithers of color along with the occasional squarish area. There’s not much similarity between Roth and Schur. Schur’s paintings [see recent catalog} make use of the flat front to create visual intricacies that come together to form bold though private statements. Roth, on the other hand, grew out of a post minimal moment. Earlier practices utilize a tongue-in-cheek dialog between functional item and formal structure, plane, color, and their interplay, often bringing these right out for us to peer around. Recent work puzzles formal motifs [one can, in cases, think of Myron Stout] with spatial anomalies that register ‘playful’ and even ‘trickster’ that misbehave on the surfaces, front and sides of tiny plywood constructions.These come alive as you view the planes at different angles. They are odd though remain austere. Tags: Construction, Merger, Painting, Richard Roth, Richard Schur, Rocket gallery. Bookmark the permalink.